Micronesia - IOM has opened the Pacific’s first Migrant Resource Centre in Pohnpei, capital of the Federated States of Micronesia (FSM). The new facility will provide training and services for FSM and other Pacific island nation citizens who plan on moving to the United States, particularly to Hawaii and Guam. It will provide pre-departure orientation, inform on the dangers of human trafficking, and facilitate referrals to service providers in Guam and Hawaii on legal, medical and social welfare matters. 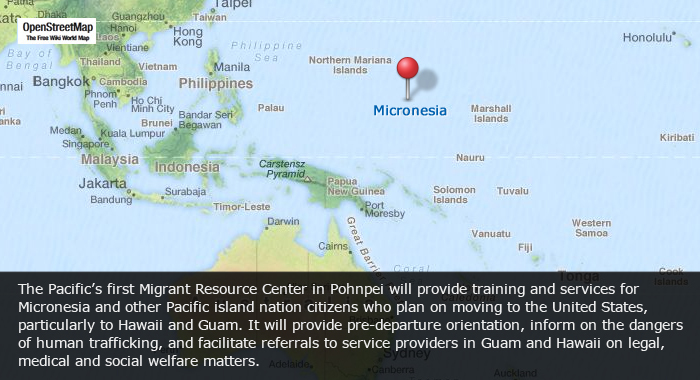 The centre is complemented by a Migrant Information Service Center at Pohnpei International Airport. Work on a dedicated informational website and telephone hotline for migrants is underway. At the Centre’s official opening last week, IOM Regional Director Andrew Bruce paid tribute to the work of the FSM National Government, the State of Pohnpei, and the governments of the United States, Japan and Australia for their continuing support and partnership. “Many Micronesians have already migrated to the United States and its territories and we can foresee a time when more will choose to make the same journey. The role of this centre is to help in making that journey smoother, to reduce the risks of exploitation and other forms of abuse,” he noted.